Welcome to the monthly e-bulletin of the South Asia Media Solidarity Network (SAMSN). The next bulletin will be sent on April 15, 2016, and your inputs are most welcome. A barrage of legal cases have been filed against Mahfuz Anam, the editor and publisher of The Daily Star, an English daily newspaper, in an attempt to intimidate the media and muzzle press freedom in Bangladesh. A total of 79 lawsuits, including 17 sedition pleas and 62 defamation cases, were filed against Anam in 53 districts across Bangladesh by various individuals and political groups. The legal actions were launched after Anam admitted, during a televised interview on 3 February, to a lapse in editorial judgement while publishing reports. These reports were based on information supplied by the country’s task force intelligence cell, during the caretaker government’s regime, almost a decade ago. The military-backed interim government declared a state of emergency in 2007, detaining the leaders of the two biggest political parties and initiating cases against them as well. More here, here and here. On March 8, International Women’s Day (#IWD), the IFJ and its affiliates celebrated the work of women journalists and media workers within our region and also across the globe. The focus of the IFJ campaign was gender equality, and continuing the forward push for gender equity in the media. The IFJ Asia Pacific published two blogs for #IWD from South Asia. The first blog celebrated the work of GEO TV Network to establish a sexual harassment policy in Pakistan. Meanwhile, the second blog discussed and elaborated on the challenges for women journalists in Sri Lanka. Marking the day, the Pakistan Federal Union of Journalists (PFUJ) organized various programs in Karachi and Lahore. The PFUJ and the Karachi Union of Journalists organized a panel discussion with focus on gender issues in media. The participants talked on the issues faced by women journalists in the workplace and how to make the working environment safer. During the discussion, it was suggested that a women committee be formed of KUJ women members which will be specifically take up cases of harassment at the workplace and formed a WhatsApps group for sharing information. The PFUJ and the Punjab Union of Journalists organized a seminar in Lahore urging to provide equal rights and better working atmosphere to the women journalists on work places so that they could perform their duties with equal liberty. A number of working women journalists attended the event and shared their views and difficulties faced by them. The Delhi Union of Journalists held first meeting of our gender equity council chaired by General Secretary Sujata Madhok. The DUJ and its Gender Council commends with pride the role of women journalists in upholding media rights and freedoms in the face of growing assaults on the freedom of expression. The DUJ noted with dismay the increasing attacks on the media as well as various sections of our society for exercising the right to debate and dissent. In recent weeks several women journalists have been variously targeted for their work. According to IFJ statistics, India was rated the second most lethal country for journalists in the Asia-Pacific during 2015. Last month, journalist safety continued to be an issue across the country, culminating with the shooting that killed Tarun Mishra in eastern Uttar Pradesh. Mishra, the bureau chief of Jan Sandesh Times (a Hindi newspaper in Sultanpur), was killed while driving with his uncle. Their vehicle was fired upon by two unidentified people on motorbikes. According to the Uttar Pradesh Journalists union, Mishra was potentially targeted for his writings about illegal black market activities in Uttar Pradesh, sometimes referred to as the ‘mud mafia’. More here. Across India, the decline in press freedoms remains a key concern. On February 15, a number of journalists were attacked during the court hearing of sedition charges against the Jawaharlal Nehru University (JNU) Student Union president Kanaihya Kumar. Lawyers asked JNU teachers and students to vacate the front seats in the court room. However they refused to do so, and the lawyers allegedly attacked them before also turning on the media that was present there as well. In connection with the media coverage of the case, several newspapers reported that Delhi police has been calling or visiting the homes of journalists who have reported on the police crackdown at JNU. Read IFJ statement here, IJU statement here, NUJI statement in Hindi here and read morehere. In late February, Sindhu Sooryakumar, a news anchor with the Malayalam-language news channel, Asianet, was continuously harassed in Thiruvananthapuram, Kerala, India. On the 26thof February, she hosted a discussion on whether celebrating Mahishasur Jayanti (Religious Festival) could be considered an act of Treason. Following the program, Sooryakumar’s phone number was circulated on social media after which she received over 2,000 harassing and abusive phone calls and messages calling her a prostitute. Some members of the Rashtriya Swayam Sevak Sangh (RSS), a militant Hindu organization, and the ruling Bharatiya Janata Party were also found to have harassed her. More here and here. Similarly, Mathrubhumi, a daily Malayalam newspaper in Kerala, faced an online boycott drive from radical Muslim groups after the publication was accused of publishing alleged slurs against the Prophet Mohammad. The newspaper offered an apology but the boycott had continued. Morehere. The Nepal International Media Partnership (NIMP), a coalition of media rights organizations including the IFJ, launched the Report of the International Mission to Nepal for Promoting Freedom of Expression and Safety of Journalist. The report calls on the Nepali government to take effective steps to resolve all serious cases of attacks on and killings of journalists, as well as introducing a journalist safety mechanism at the National Human Rights Commission (NHRC). The report came ten months after the NIMP took part in a 6-day mission hosted by the IFJ affiliate, Federation of Nepalese Journalists (FNJ). The report’s recommendations called for effective steps to resolve all serious cases of attacks on journalists, the implementation of the Working Journalist Act, the development of ethical guidelines and professional standards, along with protection measures for all media staff. The NIMP report also called for the development of a safety mechanism based at the NHRC, tailoring to the specific situation and needs of Nepal. The mechanism should be developed through consultation with key media groups and stakeholders, and adequate resources must be allocated to ensure that it can discharge its mandate effectively. More here. On March 4; protests, rallies and sit-ins were held across Pakistan, against the execution of Mumtaz Qadri, the killer of the former governor of Punjab, Salman Taseer. In Hyderabad, Jamiat-i-Ulema Pakistan (JUP) and Pakistan Sunni Tehreek organised rallies outside the Hyderabad Press Club. During the rally, demonstrators stormed the press club premises, attacking staff and members, ransacking the offices and torching a number of motorcycles. A number of members also had to jump over walls and fences to escape the attack. Press Club president, Ali Ahmed, was beaten during the attack, while a cameraman from 92-News, Qasim fractured his leg. Several others were also injured trying to protect the premises. Additionally, numerous calls were made to the police, however no officers showed up. In Lahore, rallies held near Anarkali turned violent towards the media, with DSNG vans of Abb Tak and Aaj News channel left damaged. The offices of Aaj News were damaged as well. A number of media workers were also attacked, including PFUJ Lahore-based leader, Rana Azeem, who sustained injuries requiring hospital treatment. The protesters allegedly targeted the media for not covering the funeral of Qadri, following his execution on March 2. There were also reports of attacks on media workers and equipment in Karachi, and Faisalabad. Read more here andhere. The Indian Journalists Union (IJU) voiced concerns over taxing 60 percent of the accumulated amount in the Employees Provident Fund (EPF), at the time of withdrawal from 1 April 2016, terming it as retrograde and anti-employee measure. Presently, the withdrawal of the accumulated EPF corpus is tax-free. This can affect over 6.6 crore (66 million) EPF subscribers in the country. The IJU said that the threshold limit of Rs. 15 thousand for imposing the tax, was meaningless for working journalists as the minimum wage recommended by the Majithia Wage Board is about 18 thousand thousand rupees at the current price level. More here. A high-level delegation of the National Union of Journalists (India) called on President of India, Shri Pranab Mukherjee and demanded the enactment of a Journalists Protection Law, and the constitution of the Media Commission and Media Council. Referring to the attack on journalists in the Patiala House court recently, the NUJ delegation said such attacks can be curbed through a Journalists’ Protection Act. The enactment of the Act will help in speedy action against the culprits and the media persons will be able to work more freely under the protection of the Law. Morehere. On February 13, Hussain Fariyaz, a sports journalist for the opposition-aligned Rajje TV, was arrested when plain-clothed police officers entered the Rajje TV newsroom. Fariyaz was arrested without a court warrant and detained for two hours as well. When he was released, police reportedly admitted to making a mistake with his arrest. Photos of the arrest, show that Fariyaz’s clothes were ripped, while he was being manhandled and pushed into a police vehicle. Rajje TV claimed that Fariyaz was arrested for taking a photo of a police officer stealing a bottle of alcohol during a raid. However, the police said in a statement that Fariyaz was arrested for ‘disobeying orders’. More here. Meanwhile, the criminal court has indefinitely barred three government-aligned newspapers. This took place a day after court officials forced reporters to delete photos of a judge from their cameras. The court later also barred opposition-aligned Raajje TV. Reporters from Haveeru Online, V News, Avas and Raajje TV were prohibited from observing trials, but were not given a reason for the suspension. The head of the Maldives Broadcasting Commission and the state regulator, met with Supreme Court Justices to raise concerns over the ban. More here, here and here. a. Forgetting the basics, by Sam Jahan (Bangladesh). What shocked me most were the acts of pro-government organisation leaders… Half a dozen Members of Parliament accused him during a parliamentary session. The son of the PM also said he wants him (Anam) ‘behind bars and on trial for treason’. Bangladeshi journalist Sam Jahan terms the lawsuits against The Daily Star editor as ‘the carnival of lawsuits!’ Read more. b. Against all odds: Reporting from the Maldives, by Mohamed Junayd A. Saleem. Harassed, arrested, prosecuted and even violently attacked, journalism has never seen such gloomy days in Maldives. Since the ironclad monopoly on Freedom of Speech and Expression, and Freedom of the Media was released from its shackles in the late 2000s. Though the Maldives now guarantees Freedom of Expression, Freedom of Speech and Freedom of the Media under its newly enacted constitution, the reality is not as upbeat. Mohamed Saleem, the station-in-charge at Raajje TV discusses the challenges for journalists in the Maldives, working for the only dedicated news channel in the Maldives. Read more. c. Delhi’s two black days of terror on the press, by S. K. Pande. Delhi Union of Journalists (DUJ) president, SK Pande, wrote about the recent challenges for the media in India following a spate of attacks. Pande documents the situation and the challenges ahead for the press, both in securing its safety and changing the attitudes against the press. Read more. 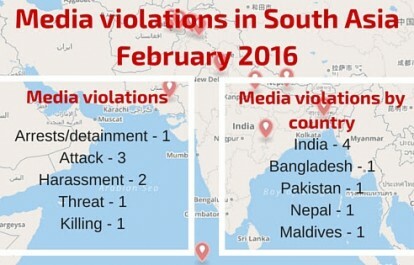 d. Protection for journalists needed as South Asia remains perilously dangerous. On February 5, 2016, UNESCO, the IFJ and the WAN-IFRA organized a conference ‘News Organisations Standing Up for the Safety of Media Professionals ‘with an aim of strengthening the safety of journalists globally, by working out the possible actions that could be carried out to ensure a risk-free media environment. IFJ South Asia Coordinator, Ujjwal Acharya talks about the situation in South Asia and the relevance of the conference recommendations. Read more. In a society like Pakistan, a large number of people are not aware of what constitutes harassment – including sexual harassment. With the launch of the private broadcast media in Pakistan at the turn of the century, a large number of women joined the profession. At the time, not many organizations were aware of the problem of sexual harassment in the workplace. Fortunately, one of the country’s largest media networks, Geo TV Network was quite aware of sexual harassment, writes Lubna Jerer Naqvi. Read more. In April and May 2015, devastating earthquakes hit Nepal, virtually levelling the country. From February 27 to 29, the Federation of Nepali Journalists, supported by the DART Centre, the IFJ and the Media Safety & Solidarity Network, held a three-day ‘train the trainer’ workshop on trauma and journalism for the country’s media. The workshop was held in Kathmandu, and focused on training journalists in trauma reporting, as well as offering counselling for those impacted by the disaster. February 26 marked one year since Bangladeshi-American freelance blogger, Avijit Roy, was hacked to death on a street in Dhaka. Roy was a leading secular blogger, and also the founder of the freethinking blog ‘Mukto Muno’ (meaning “freethinkers” in English). He was killed when he was attacked and hacked to death on the street as he and his wife left a book fair. His wife was injured, but survived the attack. Roy was the first of five individuals murdered by Islamist extremists in Bangladesh in 2015. We remember Avijit Roy and his work, while standing alongside the media community of Bangladesh, as they fight for press freedom and freedom of expression. His family voices dismay over the pace of the probe, although police claim to have identified his killers. 12. A Net of Rights? New film links Human Rights and Internet Protocols. On March 4, Article 19 and Coding Rights launched Net of Rights, a short film which explores the link between internet protocols and human rights online. To protect human rights online, it will be necessary to explore and map the link between the rights and protocol, ensuring the survival of a decentralized and collaborative internet, in which freedom of expression through unimpeded connectivity remains a central principle, and a guiding force. Watch the film here, read about ithere and visit the Net of Rights website here. 13. Sri Lanka Appoints Relief Committee for Journalists Suffered Under Autocratic Regime. A special committee has been appointed under the directive of President Maithripala Sirisena to provide solutions to the grievances faced by journalists during the autocratic regime of former president Mahinda Rajapaksha. Any journalists who faced disturbances and damages to their properties, or suffered from injustices during their work between the years January 2005 to January 2015, will be provided with reliefs. More here. Meanwhile, the government has revived a move to censor news websites. The Ministry of Parliamentary Reforms and Mass Media took out an advertisement in the state-run Daily News warning websites that they must register before the end of this month or they will be considered “unlawful.” More here. SAMSN is a group of journalists’ trade unions, press freedom organizations and journalists in South Asia that work together to support freedom of expression and association in the region.